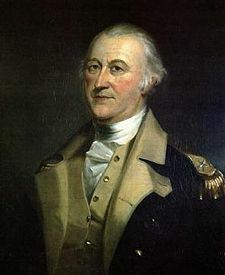 I’ve often wondered how Gen. Artemas Ward reacted to the letters he received from the headquarters of his commander, Gen. George Washington, on 2-3 Mar 1776. But we don’t know what Ward would have said to Washington because he didn’t put that in writing. Perhaps he was even gratified that his commander had become so enthusiastic about his suggestion. That 2100 Men viz 1 Brigadier Genl. 3 Coll. 3 Lieut Coll. 3 Majors 23 Capts 71 Subs. 100 Sergts. 3 Drums 1916 Rank. & file 3 Surgeons 3 Mates are to be Paraded this Eveng at Six oclock precisely, at Dorchester, completely Armd & accoutred, with one days Provision ready cook’d. Before the men are marchd from the regimental Parades, they are to be handsomely drawn up two deep. Their arms, Amunition & Accoutraments strictly examin’d, the commission’d & non-commission’d Officers properly posted. The Officers will give particular Attention to their own Divisions, whether they are employ’d in the work, or as a covering Party, & not shift from one part of the Battallion to another. This will give an Opportunity for ye free Circulation to the Orders of the Commanding Officer, & enable him to conduct any movement with less Danger of Confusion, & greater Probability of Success. The Officers will mark well the Behavior of their men; that ye Bravery & Resolution of the good Soldier may not pass unrewarded; & Meanness & Cowardice meet with just Contempt. At 3 Oclock Tomorrow morn’g, will be paraded for the Relief of the above Party, at ye same Place, 3000 Men viz 1 Brigadier Genl. 5 Coll 5 Lieut. Coll 5 Majors 30 Capts 92 Subs 118 Sergts 5 Drums 2342 Rank & File 5 Surgeons 5 Mates, Accoutred & posted as above with one Days Provision ready cook’d. The 5 Companies of Rifle men equipt as above are to parade at the same Place & time. At which time the Remainder of all ye Regts are to be turn’d out & take their respective Alarm Posts. The Party that is reliev’d from Dorchester is not to be dismiss’d as soon as reliev’d; but to join their respective Regts at their Alarm posts, & wait for further Orders. The Genl. expects that in case of an attack, the Officers exert themselves to prevent their men from throwing away their Fire before the Enemy are within Reach, & recommends that no Soldier fire at any time without a particular Object in View; single Guns well aim’d and briskly fir’d, have a greater Tendency to disconcert & do more Damage to an Enemy, than firing by Plattoons. The Surgeons and Mates are to be equip’d with every thing necessary for their department. It is ordered that the whole Camp keep by them one Days Provision ready cook’d; & that no Officer or Soldier strole from their Quarters. 2500 Men Are to parade every Morng equip’d, at ye same hour & Place. Brigadier General Thomas is to take the Command of 2100 Men which are to be paraded at Dorchester at six o’Clock this Evening, with which he is to proceed to Dorchester Point, and there throw up such works on the two commanding Eminences, as with the advice of the Engineer [probably Col. Richard Gridley] shall think most proper for the defence of the ground & annoyance of the Enemy and defend the same. Capt. Hugh Stevenson is to take the command of the three Companies of Rifle men in this Incampment, & also the two Companies which are ordered here from Cambridge; & at three Oclock tomorrow Morning proceed to Dorchester Point, there to obey such orders as he shall receive from Brigadier Genl. Thomas, or the Commanding Officer on that Point. The length and detail of all those orders on 2-4 March make a sharp contrast to what Ward had told his officers back on 15 June 1775, when the provincials had decided to fortify Bunker’s Hill. Moving onto Dorchester Heights was a more challenging operation, but this time the army had been preparing for weeks. The 2,100 soldiers Ward sent out first were equipped not just with entrenching tools and their muskets. There were also 300 wagons loaded with bundles of hay to create a shield along the causeway and prefab pieces of fortification to assemble on the heights. There were the riflemen to guard the shoreline. There was the cover of an ongoing cannonade. And Ward had 3,000 more men ready to relieve the soldiers who would build the works—that hadn’t worked well back in June. And of course there were barrels. TOMORROW: The men with the bright ideas.